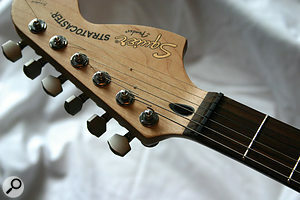 Many common tuning stability problems associated with guitars can be traced back to the nut, especially on instruments fitted with tremolos, as the string tends to stick in the nut slots, preventing it from returning to pitch when the tremolo arm is released. Many players address this issue by using graphite or graphite/grease mixtures on the nut slots when fitting new strings, but in recent years we've seen various graphite- or PTFE-impregnated nuts come onto the market. In my experience these really help improve tuning stability and avoid the need for separate lubricants. Probably the best-known brand comes from Graphtech, whose black Trem Nuts have been available for DIY fitting for many years. Trem Nuts (£4.95-£9.95) use a polymer base material impregnated with Teflon; as the strings move across the surface, they release more lubricant. They are fitted as standard by numerous major guitar manufacturers, including Carvin, Parker, Brian Moore Custom Guitars, Steinberger and Fender Custom Shop. I've fitted them to most of my own guitars. Both blank and pre-cut versions (for many popular models, including Fender Strats and Telecasters) are available. Where possible, I use the pre-cut ones, then dress the slots, if necessary, using conventional nut files to get the string clearance over the first fret as low as possible without buzzing. Providing the slots are wide enough to accommodate the string without pinching it, these nuts come as close as you can get to the ideal for preventing string 'hang-up' and they're also good for sustain. If you don't have nut files, you can use abrasive paper to remove material from the bottom of the nut to achieve the same fret clearance. Bridge saddles (String Savers; £25.95-£59.95) and string 'T's are available in the same material. Although you may not need to replace your bridge saddles to chieve stable tuning, the Graphtech versions seem to eliminate string breakage at this point, and there's no apparent loss of sustain. I first used them on an American Deluxe Fender Strat whose strings always used to break at the bridge, and they cured the problem. 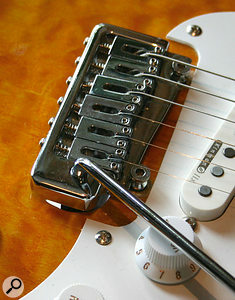 When using a guitar fitted with a tremolo, replacing the string 'T's with low-friction equivalents is well worth it, as conventional 'T's simply add another friction point where the strings can hang up. For acoustic guitars or electric instruments not fitted with tremolos (or for tremolo instruments, if you're a graphite and grease man), Graphtech also have a synthetic bone range of nuts and string-pins (claimed to improve sustain and tone when compared with plastic pins) called Tusq. This material looks like bone or ivory and can be cut and sanded in the same way, but because it doesn't have the grain or soft spots of the natural material, it behaves much more consistently and tends to give a slightly brighter tone. Again, you can buy nuts pre-cut or as blanks (£4.95-£9.95). I fitted one to a Japanese-built Fender Squier guitar to try it out, and it certainly emphasised the bright, zingy edge that Strats are famous for. With a little lubricant on the slots, it also worked perfectly with the tremolo. I dressed the slots slightly and found the material very easy to file. A Ferraglide saddle.One of the more recent additions to the Graphtech range is the Ferraglide saddle (from £39.95), a conventional-looking stainless-steel bridge saddle but with an insert made of the same material as their trem nuts at the point where the string bears upon the surface. These are available to fit numerous popular guitar models and have the advantage that they retain the look of the original hardware. I fitted a set to a replacement Strat tremolo with no difficulty and they looked almost indistinguishable from the original parts, while affording all the benefits of a solid String Saver saddle. For guitars that use a Tunamatic bridge or equivalent, Graphtech also make a direct replacement Super Bridge fitted with their polymer/PTFE saddle pieces. Chrome, nickel, gold and black versions are available. This is the one product in the range that I haven't tried on my own instruments, but as the saddle material is the same as used for their other low-friction parts, it should work equally well. Graphtech's nuts are so cheap that you'd need a very good reason to fit anything else, and the same is true of their string 'T's, which are vastly superior to the usual non-roller metal parts. With bridge saddles, the choice is not so clear-cut, as much depends on whether your existing setup is giving you string breakage or tuning problems. If it is, these Graphtech solutions will definitely help, but if not, perhaps it's wisest to leave well alone. SUMMARY: These problem-solving products really do work!